Cook hearty casseroles, sizzle sausages, and braise lamb in our sturdy cast iron skillets, pots, and Dutch ovens. Keep your kitchen efficient with induction ready cookware. These state-of-the-art pots and pans are designed to reduce heat-up and recovery times. Create sauces, saute vegetables, and prepare steaks with our fry pans and sauce pans, including stainless steel and non-stick options. 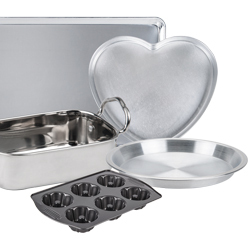 Stock your kitchen with these top-of-the-line bakery pans, cake molds, cookie sheets, and pie pans. Proper bakeware is essential for pastry chefs. 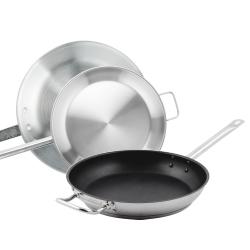 Vigor produces commercial-grade cookware for high-volume establishments, including items such as frying pans, stock pots, pasta cookers, and more. Our selection of Vollrath cookware includes high-quality pots and pans that are built to meet the demands of busy kitchen environments. If you’re searching for cookware covers and accessories like lids for pots and pans, pan handle covers, and steamer racks, we carry a wide selection. 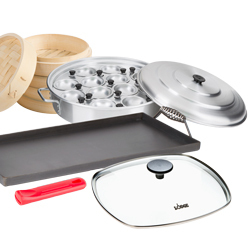 Whether you need a pan for frying, a pot for sauces, a wok for Asian dishes, or an egg poacher for breakfast items, our products will cover all of your commercial cookware needs! Make sure you have the right quality cooking equipment to match your high-quality restaurant cookware, and don’t forget that proper food preparation is just as crucial to executing the perfect dish as having great equipment and ingredients. Be sure to browse our wide selection of tabletop restaurant supplies for everything from plates and bowls to flatware and beverageware when looking for the best way to present your menu. If you're wondering where to buy cookware, we have a large selection of cookware for sale at the lowest prices. Choosing the right cookware to fit your kitchen's needs is vital to the day-to-day operations of your restaurant. There are many different types of cookware to help you saute vegetables, create a great soup, or roast the perfect main entree. Stir fry, soup, egg rolls, lo mein - you name it, you can make it in a wok . One of the most versatile cooking pans in the world, the simple design of these famous pans originated in China and are now used the world over. They come in a variety of materials and forms, but the signature style of these round cooking pans is as useful as it is recognizable. 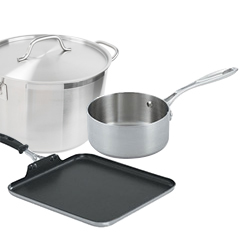 A large selection of stainless steel and aluminum fry pans in various sizes and styles provides the perfect platform to prepare your products. 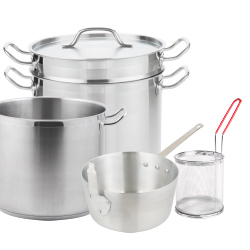 Sauce pots and pans are also essential to prepare sauces, dressings, and gravies to complement your meals. 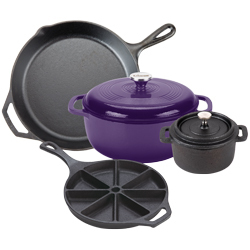 Cast iron skillets can be used for a variety of jobs in the kitchen, and retain heat well. 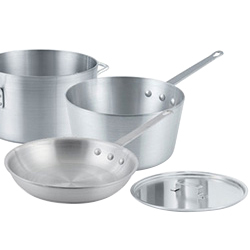 Copper commercial cookware is available for a variety of uses, and in a huge selection of sizes. 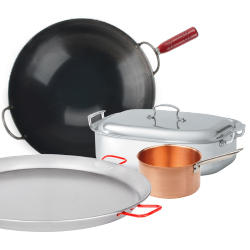 Copper cookware offers excellent heat conduction and cuts down on hot spots that can cause scorching in other products. Do you need to prepare a lot of one specific dish, or possibly large volumes of sauce, soup or stew but don't think it can be done all at once? A stockpot is the perfect solution to your problem. We carry aluminum and stainless steel stockpots in an array of sizes to satisfy even your largest volume cooking and simmering needs! We also make cutting out the fat easy with our non-stick fry pans! Food does not stick to the surface of the pan, eliminating the need for oils, grease, or spray releases which can add fat and calories to your dishes. 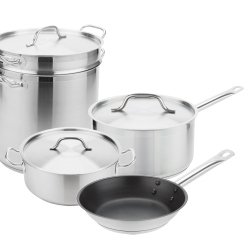 We also offer a wide range of commercial cookware as well! Asian woks are a necessity in Chinese, Japanese, Thai, or Fusion restaurants. Need to cook large quantities of pasta quickly? A quality commercial pasta cooker can drastically cut down on your preparation time! Fry pots and baskets are a fundamental tool for establishments needing to bread and fry a variety of products. Rarebits are great oven to table items to serve appetizers and side dishes like twice baked potatoes, crab dips, mini casseroles and much more!